Binic Table Lampe by Foscarini Material: Batch-dyed ABS and polycarbonate Light Source: LED retrofit, Fluo 1x 12W Dimmable E14 Compact and fun, the Binic table lamp is an immediate winner, thanks to its playful, coloured shapes and the compact size which make it ideal for endless situations within the home. 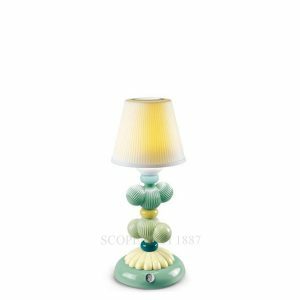 The Gregg table lamps have a delightful organic shape, like pebbles honed by a river, and they are made of hand-blown glass in various sizes. 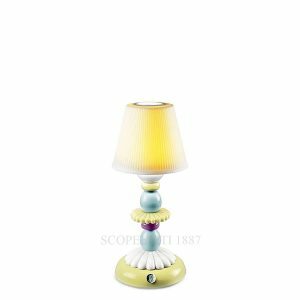 Table or oor lamp with diused light. White satin nish hand-blown diuser achieved using glass blowing procedure without turning the glass in the mould (referred to as ""stationary""), subject to immersion in acid. The glass in the medium and large version is incorporated with a matt transparent injection moulded polycarbonate ring nut, which is in white polycarbonate in the small version. White epoxy powder coated metal supporting base and matt injection moulded transparent polycarbonate lamp holder support. ON/OFF switch on the transparent cable or with dimmer for the gradual brightness adjustment. A product of natural inspiration and extensive research, Gregg’s shape is reminiscent of a large pebble, its surface polished by the water. It could even be seen as the egg of some mythological beast, a symbol of creation and re-birth. Pure volume with a familiar ease of interpretation, yet one that is surprising, because Gregg’s asymmetric shape changes depending on the point of view of the person observing it. This is a new solution where a traditional material like glass becomes a tool in the designer’s hands to give an original character to an environment. There are three dierent sizes in the hanging, table, ceiling and wall versions and four dierent solutions for the oor lamp: the Gregg collection is one of the most versatile and transversal and can be easily placed in any type of setting. In the home environment the warm, uniform light produced by the white satined diuser and its essential style have a strong functional and decorative value. Thanks to the closed shape of the diuser, the bulb is screened in all directions, which protects from dazzle and makes it easy to place even at dierent heights. When part of a composition, Gregg is suitable for some of the most surprising uses. A ’raindrop’ structure highlights the vertical extension of a window or stairway, producing an extremely striking eect. Vertical arrangement of a multitude of suspensions at various heights generates spectacular luminous false ceilings. The repetition of the volume along a line produces new perspectives to create trompe l’oeil eect. Founded in 1920 on the famed Venetian island of Murano, Italy, Venini Glassworks honors the uncompromising nature of its master craftsmen by tirelessly seeking the avant-garde. Whether exploring new, rich colors and textures of glass or introducing such elements as the decorative filaments that have now become a hallmark of Murano glass, Venini has been pivotal in moving the art form beyond its traditional limitations and making it truly contemporary.Through innovative original designs as well as collaborations with internationally renowned artists and architects, no other glassmaker has done as much as Venini to extend the tradition of Venetian glass into the modern era. The company’s bold vision and superior craft has resulted in Venini glass and lighting pieces being displayed as part of the collections of such museums as The Museum of Modern Art, The Victoria and Albert Museum, The Centre Georges Pompidou and The Art Institute of Chicago. In Fall 2013, one of Venini’s key early masters will be the subject of The Metropolitan Museum of Art’s Venetian Glass by Carlo Scarpa: The Venini Company, 1932-1947.Venini’s nearly century-long commitment to both progress and perfection allows them to offer a collection of art glass and lighting that is as daring as it is exquisite. Founded in 1920 on the famed Venetian island of Murano, Italy, Venini Glassworks honors the uncompromising nature of its master craftsmen by tirelessly seeking the avant-garde. Whether exploring new, rich colors and textures of glass or introducing such elements as the decorative filaments that have now become a hallmark of Murano glass, Venini has been pivotal in moving the art form beyond its traditional limitations and making it truly contemporary. Through innovative original designs as well as collaborations with internationally renowned artists and architects, no other glassmaker has done as much as Venini to extend the tradition of Venetian glass into the modern era. The mother is sitting in a mermaid pose on a rock draped in soft fabric which partially covers her sensual forms. The child sitting on her lap playfully seeks a contact with the father who elegantly leans against them in a relaxed standing position with his legs crossed and plays with his child’s adorable feet. 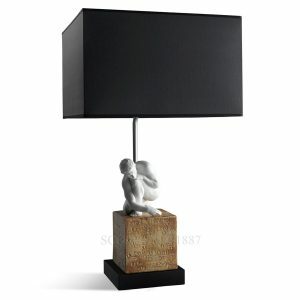 The lamp is completed by an essential modern rectangular shade. A stunning centre piece for any Home. This beautiful animal with its distinctive anatomy, more rounded than the English purebred, is performing what in dressage is called a ""pirouette"", an extremely difficult exercise that consists in the horse leaping, and once reaching the maximum height, kicking in the air in less than two seconds. The courbette saddle enriches the horse’s back with a grès finish in contrast with the smooth texture of the horse’s off white skin. The finishing touch is given by the beautiful flowing mane. 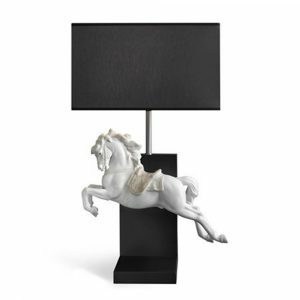 Ideal gift for horse lovers. State-of-the-art cordless lighting technology is combined with the exclusiveness of Lladró porcelain, including the translucent fez shaped shade which lets the light filter through to produce a fantastic warm colour sense. Firefly insects live in their thousands in exotic forests, on the trunks of gigantic trees. When night falls, they come out and play, creating patterns in the air, like little stars dancing happily. Anyone who has seen this amazing spectacle will never be able to forget the display of light and color. This magical quality of emitting light has inspired the Firefly collection with the first Lladró porcelain cordless lamps.‎ These creations with rechargeable batteries through USB and independent LED lighting are decorative in a versatile manner and can be inserted in a variety of environments whether indoor or outdoor. All the models are enhanced in front, from a gold plate with the flower of the logo of Lladrò which also acts as a tactile switch, adjusting the intensity. 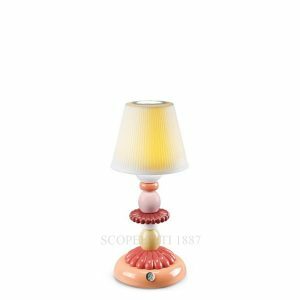 The Mademoiselle Elisabeth table lamp shade is crafted with translucent white porcelain to convey a sense of warmth to the filtered light while the other parts have an opaque finish with glazed bright tones. 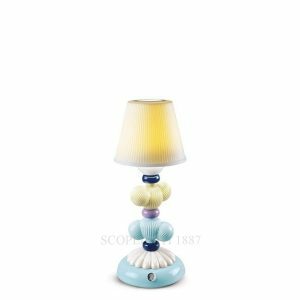 The table lamp released in Autumn 2016, vibrant and delicate at the same time, adapts to all home decors and is attractive even when turned off. 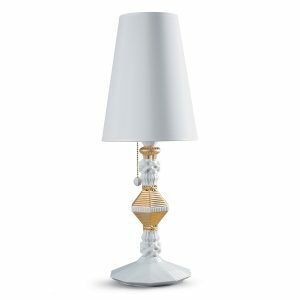 State-of-the-art cordless lighting technology is combined with the exclusiveness of Lladró porcelain, including the translucent fez shaped shade which lets the light filter through to produce a fantastic warm colour sense.Firefly insects live in their thousands in exotic forests, on the trunks of gigantic trees. When night falls, they come out and play, creating patterns in the air, like little stars dancing happily. Anyone who has seen this amazing spectacle will never be able to forget the display of light and color. This magical quality of emitting light has inspired the Firefly collection with the first Lladró porcelain cordless lamps.‎ These creations with rechargeable batteries through USB and independent LED lighting are decorative in a versatile manner and can be inserted in a variety of environments whether indoor or outdoor. All the models are enhanced in front, from a gold plate with the flower of the logo of Lladrò which also acts as a tactile switch, adjusting the intensity. 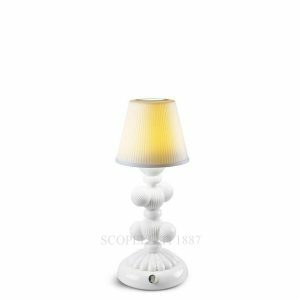 BELLE DE NUIT TABLE LAMP - GOLDEN LUSTER Size: 57 x 20 cm The Belle de Nuit white table lamp with golden luster features a fez shaped white shade with gold lining which crowns a spectacular snow white porcelain base enriched by a variety of stacked geometric designs. The contrast is created by the golden details which interrupt the white flow of the column and enrich the elegant pull cord switch. 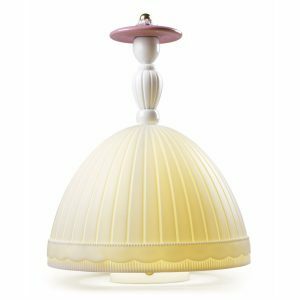 Belle de Nuit lamps decorate and illuminate with an elusive magical atmosphere our favorite rooms giving them a magical fairy tale touch evoking enchanted castles or meringue cakes. LLADRO MEDITATING WOMAN LAMP II porcelain figurine with gift box. Sculptor: José Luis Santes, Release year 2010. 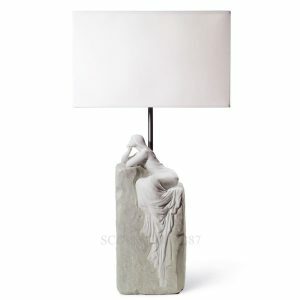 Size: 57 x 30 cm This lovely white porcelain Meditating Woman Lamp base with its essential modern rectangular shade shows a woman in thought looking out onto the horizon with her chin resting on her hand. The thick folds of her long dress are wonderfully sculpted to cover the side of the coarse base in contrast with linearity of her delicate facial features and her flowing long straight hair. The shape and pose of the female figure recalls a mermaid resting on a rock gazing out at her loving natural habitat: the sea. A stunning centre piece which will enrich any Home. 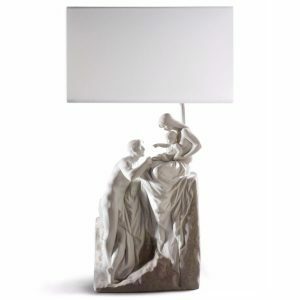 LLADRO SCIENTIA – LAMP Sculptor: Ernest Massuet Size: 67 x 30 cm This stunning Lladro porcelain piece depicts man’s knowledge and wisdom through the stream of mathematic symbols engraved on all sides of the square plinth. The light brown coloured stone block is mounted by a beautiful matte white figure of a naked man crouching while he seeks to decipher what is engraved at his feet. An elegant contrast is created by the black linear rectangular shade and base and the white sensual curves of the naked body. The ideal gift to wish good luck or to reward those who adore Science. A unique collector’s item to cherish and admire even when it is switched off. Kurage Table Lamp by Foscarini Material: Washi paper and ashwood Light Source: LED retrofit, Fluo 1x 12W E27 Kurage is a table lamp made of washi paper, meticulously hand-made by Japanese craftsmen, on slender ash-wood legs, and it is the result of the pursuit of lightness in light, the core concept for every element in the design.